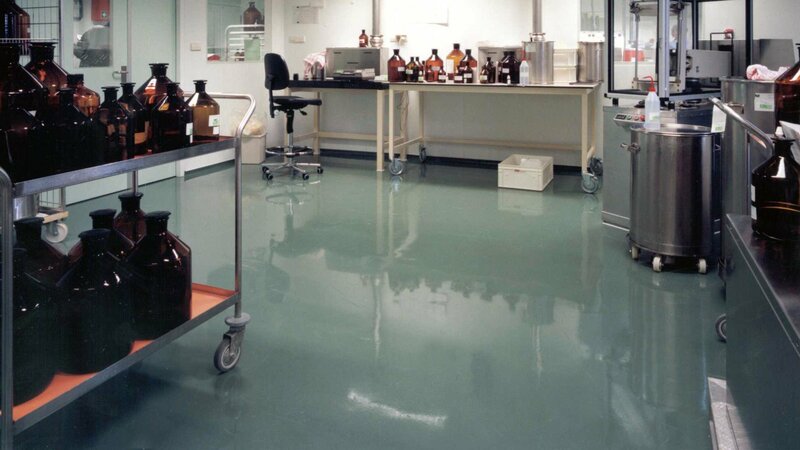 This cast flooring system is extremely resistant to chemicals. Especially the harmful effects of solvents are minimal. Its favourable flow properties create a sealed and even surface. Very suitable for medium (fork-lift truck) traffic. A chemically resistant deco-mix is optional. And: seamless, durable, impermeable to fluids, low-maintenance and applied on site by own specialists. Bolidtop 500 SAR is a 2 mm thick cast floor finishing system with very high resistance to chemicals. Bolidtop 500 SAR has an even, sealed surface and excels particularly with its resistance to inorganic acids and organic solvents such as acetone. Bolidtop 500 SAR which is applied in liquid form and is seamless is made for medium traffic such as pallet wagons and forklift trucks. Bolidtop 500 SAR is very resistant to wear. A wide range of colours gives the architect many possibilities so that the floor fits into the atmosphere of the building. Bolidtop 500 SAR is resistant to the most usual loads. Bolidtop 500 SAR is resistant to the most usual chemicals and cleaning products. No electrical properties have been specified for Bolidtop 500 SAR.